Is It Good? Captain America: Steve Rogers #2 Review – AiPT! When the last issue of Captain America: Steve Rogers came out there was so very little applause and so many cries of rage. The writer Nick Spencer was sent death threats simply because of what Cap said on the very last page. The people were enraged their favorite character was being “rewritten” to be a villain. I wasn’t one of them. I for one found the issue quite entertaining and even if there was a smidge of reason to be mad, it was way too early to tell if the big reveal was a cheap shock to increase sales, or good writing. People don’t like change, but in comics it’s a rather fluid thing. Now that issue #2 is here and we are getting a better grasp of what is going on…is it good? The first issue was well paced, filled with interesting character dynamics between Cap and his new teammates, and action packed too. It had some compelling flashbacks and of course a cliffhanger to make the world gasp (literally). That makes for a must read issue #2 if I do say so myself. As if anticipating the backlash, Spencer spends this entire issue explaining what has been going on with Red Skull now and for the last year or so. Captain America fans will only see him in flashbacks, but that’s okay, because Spencer keeps you interested every step of the way. It’s tough discussing this issue without spoiling it (though other sites already have I’m sure), but let’s just say anyone angry about the last issue can rest easy knowing there’s a bigger plot in play here. The bigger plot in play is what makes this issue so much fun. Not just the fact that we see a tender (albeit phony, for sure) side to Red Skull, but also how a villain capable of making others think what he wants can be so over his new powers. He can do anything with the powers he stole from Xavier, but when it comes to making people do what he wants and have them want it too…that’s another story entirely. That means involving a master plan that needs to be massaged and nurtured for months, which is all revealed here. Seeing the plan developed in this issue is a lot of fun and reminds us comic books have the ability to take any idea, no matter how convoluted or wacky, and make them fun. The art by Jesus Saiz continues to be solid as well. Action is light in this issue, but Saiz manages to make even the quietest of moments entertaining. I particularly like how he colors faces to give them a bit of life and depth, which is helpful in this issue with so much talking. 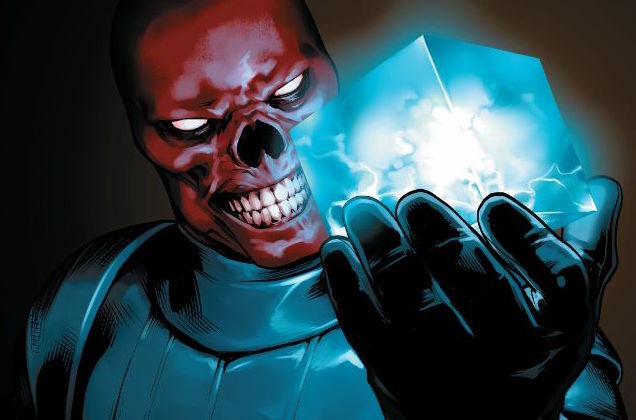 Red Skull looks fantastic too and any time the power cosmic is used it’s believable and more importantly good at showing us how powerful it can be. The eyes on Red Skull are haunting, which gives him an otherworldly sense and quite the visage of a supervillain. Some will argue this is a stereotypical reveal of the villain brainwashing the hero, i.e. none of it matters. I’d argue the setup and flashbacks reveal something so damn twisted and well thought out, it can’t be considered anything but good dramatic storytelling. There is a lack of action in this issue which is unfortunate, and when you do get it it’s in the form of flashbacks, but given how incredibly dramatic a plan Red Skull reveals I don’t see how you can’t be entertained. An entertaining master plan is revealed as we witness how it was nurtured and brought to life, literally and figuratively. The master plan and very visage of Red Skull reminds us he’s a supervillain not to be taken lightly. Is there anything more exciting than Captain America needing saving from himself?